Silvered bronze centenionalis, 23mm, 4.71gm, issued AD 348-350. Thessalonica mint. Obv: DN CONSTANTIVS PF AVG, Diademed, draped and cuirassed bust facing right. Rev: FEL TEMP REPARATIO (TSΔ* in ex. 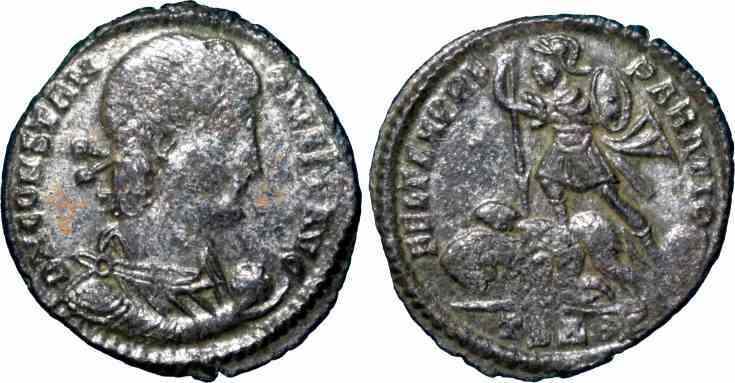 ), Roman soldier spearing fallen horseman, Γ in field. References: Sear 18134, RIC 115. This new silvered bronze denomination, sometimes known as a Centenionalis or a Maiorina, was first issued in 348 AD to mark the 1100th anniversary of the founding of Rome.